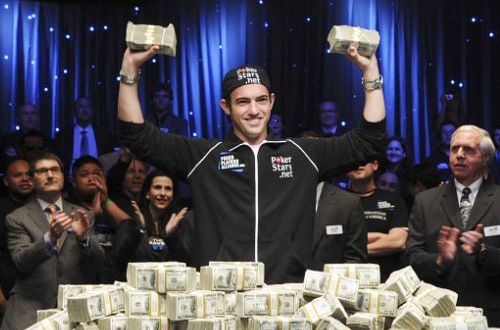 What would you do if you won the 2010 World Series of Poker? Let’s say that you do beat 6485 ‘losers’ to make it to the Final Table of the Main Event (a.k.a. The November Nine), what do I suggest that you do with your winnings? … my usual Making Money 101 advice for those dealing with large amounts of ‘found money’ is to spend no more than 5% of your windfall [AJC: for this post, I am assuming that (a) you are not a professional poker player, and (b) the amount that you win is life-changing]. Now, before you go spending most/all of that ‘guilt free’ $60k on a car, realize that in a number of years it won’t be as new and exciting as it was when you bought it, and you may not be able to afford to replace it. Well, the 5% Rule accounts for ALL of your possessions (incl. furniture, clothes, art, knick-knacks, guitars, consumer electronics, etc., etc. ), not just your car … if you spend 5% of your entire net worth on a car now, you may have problems buying ‘other stuff’ later. Now, how about the other 95%? Well, if your Number is $1,140,000 then you get to retire! But, if your Number is larger than that, then realize that what you have just earned is seed capital to reach your Number. Think about it: $1,140,000 x 5% (which is regarded as a reasonably ‘safe’ withdrawal rate) = $57k a year to live off. Nice for some, but hardly a $7 million in 7 years lifestyle. Keep your job, invest the entire $1,140,000 in something as motley as Index Funds, and you could double your capital in 10 years (assuming an 8% return). Put it into Real-Estate ($100k down, and $140k buffer against vacancies and repairs/maintenance) and you could end up with a lot more. Invest a portion in your next start up, and invest the rest (“just in case”), and you could be the next Bill Gates. … but, you don’t know where to begin? I’ve always wanted to find some sort of mentor. It would be great that everyone had a mentor that can help with advice and bouncing ideas off of … [people who’ve] owned their own businesses, residential and commercial RE. I want to get more involved in commercial RE and do not know of anyone who I could turn to on how to get started. I’m a great fan of mentors; but, when you can’t find one then you have to make do with getting info. 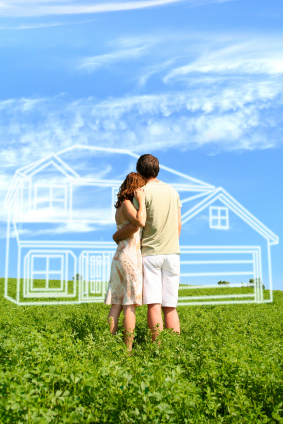 from a variety of sources: friends, accountants, attorney’s, investor’s clubs, and – of course – Realtors. Dolf de Roos: I have bought a number of his products, including his Commercial RE audio course and some s/w … more basic than Dave Lindahl’s course, but helpful nonetheless, especially for noob’s. To be fair, a few others consider these guys to be ‘scammers’, but I don’t make any money from either – have bought their material at full price and found it useful, so what more can I say? Oh, and here is a guy who is definitely NOT a scammer and has some useful stuff, too: John T Reed. Once my honeymooner guests agreed that purchasing a home would be a good investing goal, the question became how much equity to maintain? … the glass can be full or empty, but if collectors’ glasses double in value every decade, it will still be worth $200 in 10 year’s time. What happens if I put less money into the house (or other real-estate)? Simple, you have to borrow the rest: less deposit, more borrowings/mortgage … more deposit, less borrowings/mortgage. 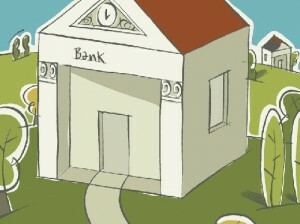 What’s the ideal amount (or %) to borrow against the property i.e. how much deposit should I put in? Given the current ‘crisis’ in domestic RE values, it’s popular to imagine a high number: 20%? 50%? 100%? But, it’s not so long ago (and, I wager it won’t be more than a decade before it comes around again) that it was popular to imagine a low number: 10%? 0%? Even negative 10% (as people borrowed 100% of the property PLUS closing costs)? But, what’s the right number?! … once you realize that it matters not what equity you have in the house as to how your future wealth increases – based on the appreciation of such fine real-estate. What does it cost/save me if I put in more/less money into the RE purchase? Well, we know it does not cost you future capital appreciation, but it does cost/save you exactly what the bank would charge in you in mortgage interest and ancillary charges … circa 4% – 5% these days. 1. Do you think that you can do better than getting ‘free money’ by owning real-estate that appreciates, perhaps even doubling every 7 to 18 years (depending upon whom you believe), leaving you with virtually ALL the excess over the original purchase price? 2. Do you think that you can invest money that would otherwise cost/earn you only 4% – 5% for more than that [Hint: how about some more of that yummy real-estate? Failing that: stocks; business; P2P lending; etc; etc; etc? But, we covered this question last week ]? Thanks to Ill Liquidity for sharing this video – and, many others – on our sister site: Share Your Number … it’s interesting to see This Clever Guy talk about the psychology of Paying Yourself First, and the Envelope System. What do you think of these Making Money 101 techniques? Do you have any others to share? Now that you’ve “made it” financially, has it changed your motivation? Was money your original motivation or was it simply your desire to create things and watch them grow? Your Life isn’t about your Money … your money is merely there to support Your Life! This is a 180 degree turnabout for how we usually live our lives … generally, solely in pursuit of money: whether just to get by, or to pursue riches. That is, until we reach some mythical point when we can stop work and RETIRE. Then what? For many of us, nothing! Which is why my motivation to become rich was driven by finding my Life’s Purpose [AJC: which is to be constantly traveling physically, mentally, spiritually]. Making the money has been the key to start making this happen, and without money it would be far more difficult to live the kind of ‘traveler’s life’ that I want [AJC: after all you need (a) lots of free time to travel … and, free time means spending money rather than earning it, and (b) travel costs – a LOT of – money].